Astronomers at the University of Southampton are using X-ray vision to reveal supermassive black holes hidden beneath thick veils of interstellar gas in our cosmic neighbourhood. Monster black holes sometimes lurk behind gas and dust, hiding from the gaze of most telescopes. But they give themselves away when material they feed on emits high-energy X-rays that NASA's NuSTAR (Nuclear Spectroscopic Telescope Array) mission can detect. That's how NuSTAR recently identified two gas-enshrouded supermassive black holes, located at the centres of nearby galaxies. The findings of the work, led by Southampton-based PhD researcher Peter Boorman and Dr Poshak Gandhi, Associate Professor and STFC Ernest Rutherford Fellow in Southampton’s Astronomy Group, were presented during a press briefing at the 229th meeting of the American Astronomical Society in Grapevine, Texas, USA this month. Joining Peter Boorman at the press briefing was Ady Annuar, a graduate student at Durham University. In a recent paper published in The Astrophysical Journal, Boorman (and colleagues from the NuSTAR active galaxies science team) described how data from NASA’s Nuclear Spectroscopic Telescope Array (NuSTAR) has been used to study the intrinsic behaviour of a ‘hidden’ supermassive black hole in a galaxy nearby to our own – IC 3639 - some 175 million light years from Earth, relatively close by in cosmic terms. “Every large galaxy in the Universe is believed to host a supermassive black hole at their centre, millions of times the mass of our Sun,” says Boorman. “These systems can devour vast quantities of matter due to their extreme gravitational pull, making the black holes grow. The in-falling matter then emits radiation across the full electromagnetic spectrum. These growing supermassive black holes are called Active Galactic Nuclei (AGN). 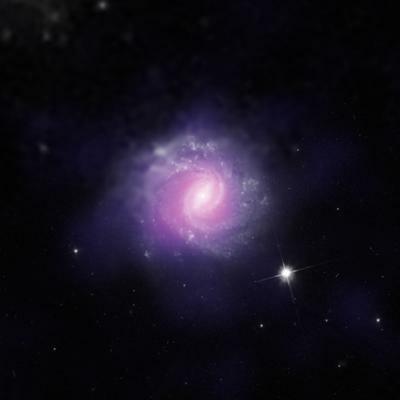 Annuar's study of the spiral galaxy NGC 1448 discovered that X-ray emission from NGC 1448, as seen by NuSTAR and NASA’s Chandra X-Ray Observatory, suggests for the first time that, like IC 3639, there must be a thick layer of gas and dust hiding the active black hole in this galaxy from our line of sight. Researchers also found that NGC 1448 has a large population of young (just 5 million year old) stars, suggesting that the galaxy produces new stars at the same time that its black hole feeds on gas and dust. "These black holes are relatively close to the Milky Way, but they have remained hidden from us until now," said Annuar. "They're like monsters hiding under your bed." Dr Gandhi believes that we are only now beginning to properly understand supermassive black hole growth in the obscured regime.